First the sore throat hits, then the cough, followed by the sniffles and sneezes as the dreaded cold hits. If you find yourself in this situation I have no doubt that you’ll want to do everything in your power to get back to normal as soon as possible and to do this you’ll have to stay clear of anything that risks making your symptoms worse. Find out what these things are here! Although it’s not an entirely straightforward process, the best way forward is to give up smoking for good. The NHS website provides tips and services to help you quit however, it may also help to go through the process with the support of your GP. As you take steps to give up smoking you could use AvenaCalm to counter withdrawal symptoms whilst snacking on sunflower seeds may help to quell cravings. Also, the unhealthy fats from fries, crisps and pastries drive inflammatory processes throughout the body which is only likely to worsen problems such as a blocked nose. There are a range of foods that can boost the immune system and so they will, in turn, help you get over a cold more quickly. This includes citrus fruits, berries, kiwis and vegetables which are all rich in that beneficial vitamin C however, don’t forget to look beyond fruit as well. Broccoli, sprouts, red peppers, spinach, cabbage and many more vegetables are also full of vitamin C. These can be incorporated into various meals, plus they make a healthy snack that will help you to avoid refined sugar and unhealthy fats. If your cold means you don’t feel like eating much and you feel you could benefit from an added dose of vitamin C then a supplement is a good option. Our Nature-C tablets are made from fruits such as blackcurrants, lemon and passion fruit meaning all the vitamin C content in them is naturally occurring. In response to stressful situations such as exams or professional workload, the immune system releases a chemical called histamine which can worsen allergies, IBS, hayfever and colds and flu. Histamine is inflammatory for example, meaning it’s likely to worsen symptoms such as a blocked nose. However, on top of this histamine can also reduce your immune defences making you more prone to bouts of cold or flu. Get serious about stress! Modern life is stressful but learning to moderate the negative effects of it is massively beneficial for the immune system, as well as many other aspects of our health. So, what can you do? Well, that really depends on the source of stress and how severe it is too. For mild stress and anxiety you could turn to Stress Relief Daytime which helps to support the nervous system. For more severe stress however, it would be beneficial to talk to someone about how you feel, be it a colleague, family member, or health professional. They may be able to offer further advice and even if they cannot sometimes the very act of talking helps to relieve pressure. Research shows that sleep is vital for the immune system and so not getting enough of it leaves you more vulnerable to colds and flu, plus if you should be hit with an infection it’s likely to be more severe too. So, failing to get the recommended amount of sleep a night (it’s 8 for adults, 8-10 for teenagers and at least 10 for children) will negatively impact immune function however, don’t forget that staying up late will have a similar effect. To support your immune system you’ll need to get a consistent supply of good quality sleep. If you’re struggling with sleep issues though, you may find it useful to have a look at our sleep hub. Here our Sleep Advisor Marianna has a wealth of information and tips to offer on how to achieve a better night’s sleep. In addition, Dormeasan may also be able to assist with better quality sleep. Made from a mix of Valerian and Hops, this natural remedy doesn’t come with any of the drowsy side effects of traditional sleep remedies. We’ve all been there - the cold and flu symptoms hit yet we remain stubborn in our determination to continue with everyday life. We go to work, do our usual activities in the evening and make no changes to our regular diet. Then a week passes and the symptoms are still there or, what’s even more likely, they get worse. 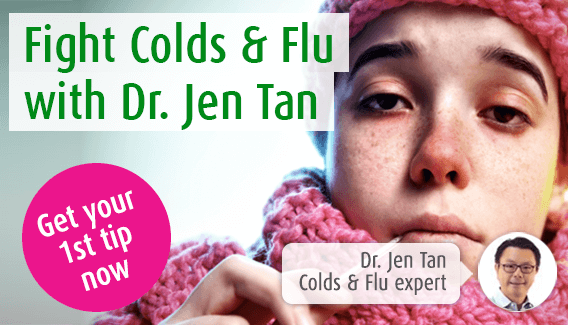 Once you have acknowledged that you’ve been hit by a cold or flu you can begin to address the symptoms so this is the best way forward. Here at A.Vogel we have a number of remedies that will help with cold and flu symptoms including Bronchoforce, our chesty cough remedy. This is made from freshly harvested ivy and thyme which helps the body expel mucus or catarrh from the chest. For nasal symptoms however, our Sinuforce Nasal Spray would be most beneficial. This contains menthol to provide rapid relief from congestion and nasal catarrh. It reduces swelling in the mucous membranes whilst leaving their protective function intact. On top of this, if you are able, don’t be afraid to take some time out to help you recover – sometimes a little rest and recuperation is what the body needs to get back to normal. When you are at full health a moderate amount of exercise comes with a whole range of benefits. It decreases our chances of developing heart disease for example, it keeps bones healthy and strong, plus it can even support the immune system. However, when you are suffering from a severe cold where symptoms such as coughing, a sore throat and fever become problematic it doesn’t make sense to put your body under more strain by trying to exercise. Take some time out! Forgo the gym for a week, hang up your gym shoes for a short while or put your swimming stuff away – whatever your sport it’s best not to do it when you’re ill. If you feel you need a little bit of exercise though, then stick to something gentle like a walk to the shops. Relying on fizzy juice, coffee, tea and alcohol can leave you dehydrated and, because these things encourage inflammation, they may also worsen symptoms such as a blocked nose. Also, if you are using over-the counter medications for your cold or flu, there may be alcohol or caffeine already in them so it may be recommended that you avoid such drinks whilst taking these. Drink more water! When you’re suffering from a cold or flu there are a number of drinks that can help however, water is one of the most important. This keeps us hydrated and flushes toxins from the body thus helping the immune system to function as normal. Also, water helps to thin mucus so if you’re suffering from a blocked nose this could ease the problem. 4 Wilson JX. Regulation of vitamin C transport. Annual Review of Nutrition, 2005, 25:1, 105-125. Wintergerst ES, Maggini and Hornig DH. Immune-Enhancing Role of Vitamin C and Zinc and Effect on Clinical Conditions. Ann Nutr Metab 2006, 50: 85-94.